Sport Parachuting in Kenya is regulated by the Kenya Civil Aviation Authority (KCAA) under the Kenya Civil Aviation (Parachute) Regulations of 2007. (www.KCAA.or.ke/downloads). Both, experienced jumpers and student jumpers, require a parachute permit from the KCAA that can be obtained at the KCAA Airworthiness Department, KCAA Headquarters, Jomo Kenyatta International Airport. Cost is Shs. 1000. Permits, once issued, do not require an annual renewal. Tandem jump candidates do not require a permit from KCAA. Tandem jumps in Kenya cannot be made at Nairobi due to the high altitude of the area. The Association ONLY organises tandem parachute jumps at sea level drop zones such as Diani Beach or Malindi. Check dates and times of our Beach Boogies for tandem jumping opportunities. 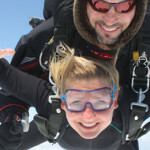 We offer tandem skydives for first timers, and the price is 350 USD per person. This involves a short brief followed by a 20-minute plane ride over the coastline. At 12,000 feet, you will jump out while attached to the front of an instructor and experience free fall for about 55 seconds. Your instructor will then open the parachute, and you will have a 5-minute canopy flight back to the beach for a soft landing. If you want a professionally edited video capturing your whole experience, it’s an additional 75 USD. The whole experience takes about 1 hour. Please allow an extra 30 minutes for editing of the video in case you want it. The AFF courses are only offered during our beach Boogies several times a year. Space is limited so please book early. The AFF course is a commitment of time and effort and should not be taken lightly. Not only aptitude, but also four to five days of unimpeded time are required for the instruction and the 10-jump programme. The cost of the AFF course is $ 2000 or KShs. equivalent at the time. A 50% advance deposit is required one month prior to the course. Study material will then be availed. Licensed Skydivers, in possession of an International Certificate Certificate of Proficiency issued by the Federation Aeronautique Internationale (www.fai.org), are welcome to jump with the Kenya Skydivers Association once in possession of the KCAA Parachute Permit. Cost per jump is $ 50 or KShs. Equivalent. Equipment hire (parachute, jumpsuit, helmet, goggles, gloves, altimeter) is $ 20 per jump. In Kenya, as in most countries, a medical certificate is not mandatory for skydiving. However, all persons wishing to make parachute jumps with the Kenya Skydivers Association are required to sign a “Liability Waiver”, absolving the Association, its officers, pilots and parachute packers, from any responsibility or blame for any and all incidents or accidents, howsoever caused. A Medical Questionnaire must also be completed and signed by all persons wishing to make parachute jumps with the Club. The Kenya Skydivers Association uses a Cessna 206 that holds five Skydivers. At Nairobi, the normal jump altitude is 7000 feet above ground level. At the Coast events in Malindi and Diani, the jump altitude is 10000 feet above sea level. A minimum of four jumpers is required on a load.